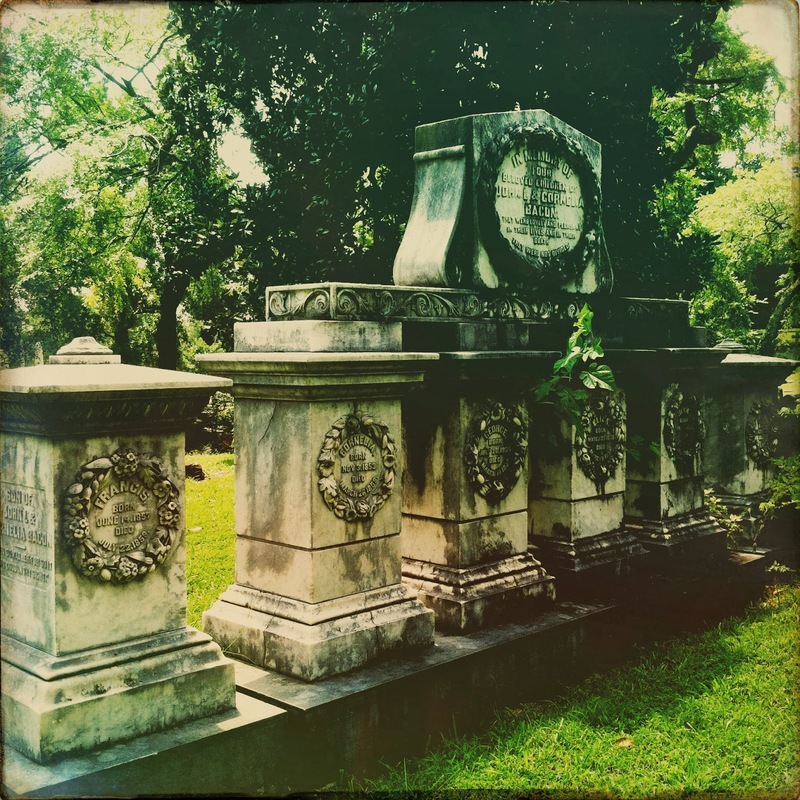 These photos of the Bacon children’s graves were taken last summer at Richmond, Virginia’s Hollywood Cemetery. Looking more closely at the dates, I’m reminded again of how fortunate we are to live in an age where childhood mortality rates aren’t nearly as high as they were during the Bacons’ short lives. All six of the children who have similarly designed markers were the offspring of John Lydall Bacon and Cornelia Fry Bacon. 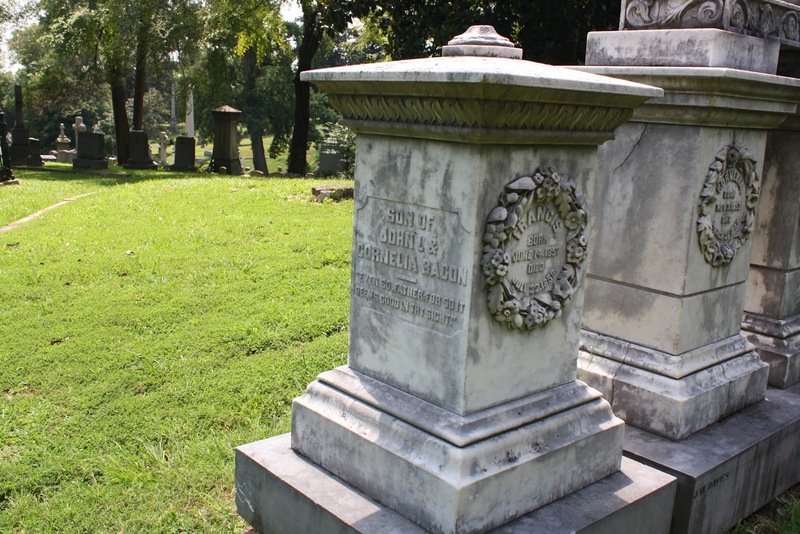 What position John held during the 1850s isn’t clear, but by 1886 he was the President of Virginia State Insurance Co. and State Bank of Virginia. 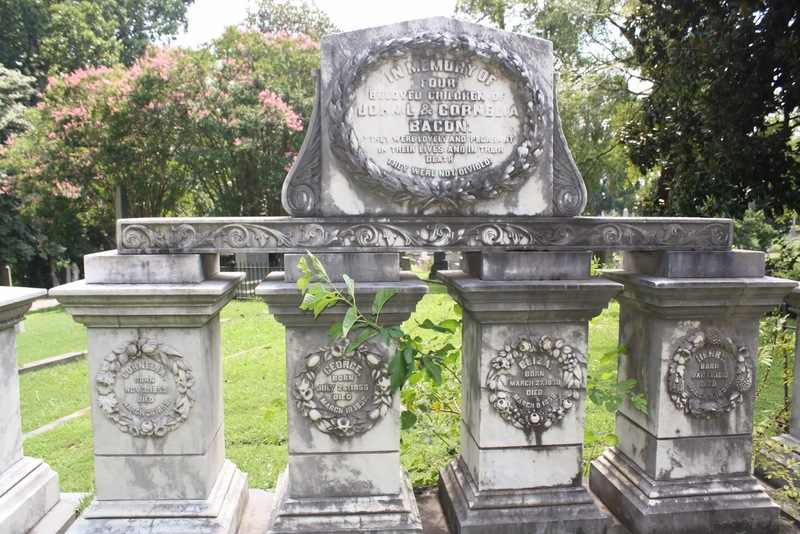 The four markers that seem to be connected belong to the siblings who all died during March 1858: Eliza (b. 1850), Henry (b. 1852), Cornelia (b. 1853), and George (b. 1855). Francis Bacon also died in 1858, but his death was a few months later in July. I wasn’t able to find out what took the lives of the Bacon children, but since nothing came up in the newspapers about an accident or fire, I believe that they died of illness. There was one death notice in the archives for George, who died on March 10. He was the third member of the family to pass away that month, with Henry on the 3rd, Eliza on the 8th, and Cornelia on the 26th. George’s funeral took place at the Monumental Church, so it’s possible that the other Bacon children’s services were also held there. As an aside, Monumental Church has a fascinating history. The ashes of 72 people who died in 1811’s Richmond Theater Fire are buried underneath the church and Edgar Allan Poe attended religious services there. On the far right is John L. Bacon Jr.’s grave. He was born in March 1847 and died in February 1849, so he never physically “met” any of his siblings. I regret not having a close-up of his marker, but there is a clear photo on his Find a Grave memorial.